The village on the Northwest side of Village Island belongs to the Mamalilikulla First Nation (MFN) people. The actual name of the village is ‘Mimkwa̱mlis, and the name means “village with rocks and island out front”. Eliot Passage, the marine waterway between Village and Pearl Islands in the Johnstone Strait region of the Central Coast of British Columbia, lay southwest of the opening of Knight Inlet. One of the features of Village Island is the abandoned village. At this time, there are no services, or public facilities. 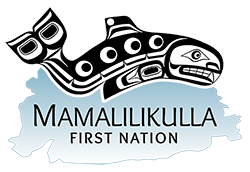 The Mamalilikulla Nation is continuing work on their management plan, which includes building associated infrastructure for visitors. In the meantime, for permission to go ashore, please contact the Band Office at 250 287 2955. Visitors will be required to pay a fee of $20 per person.